Xiaomi MIUI Official Forum › Devices › Xiaomi Mi 5/Pro › [DEVICE TEAM] EAS for Better Performance and Battery Life. Read More Here! [Others] [DEVICE TEAM] EAS for Better Performance and Battery Life. Read More Here! Welcome to another episode of Fun With Chou! This time we will talk about stuff that kind of heavy but might be important for us [especially developers] to understand: Energy Aware Scheduling [EAS]. Most of us probably are not aware for this kind of topic since it goes deeper than usual topic about performance and CPU governor. I hope I can make it easier or us to understand since the topic is too technical. But who doesn't want to have better performance and battery life for their phone? According to ARM's Developer site, Energy Aware Scheduling is an enhancement to Linux power management that unifying CPU power control under the Linux kernel. 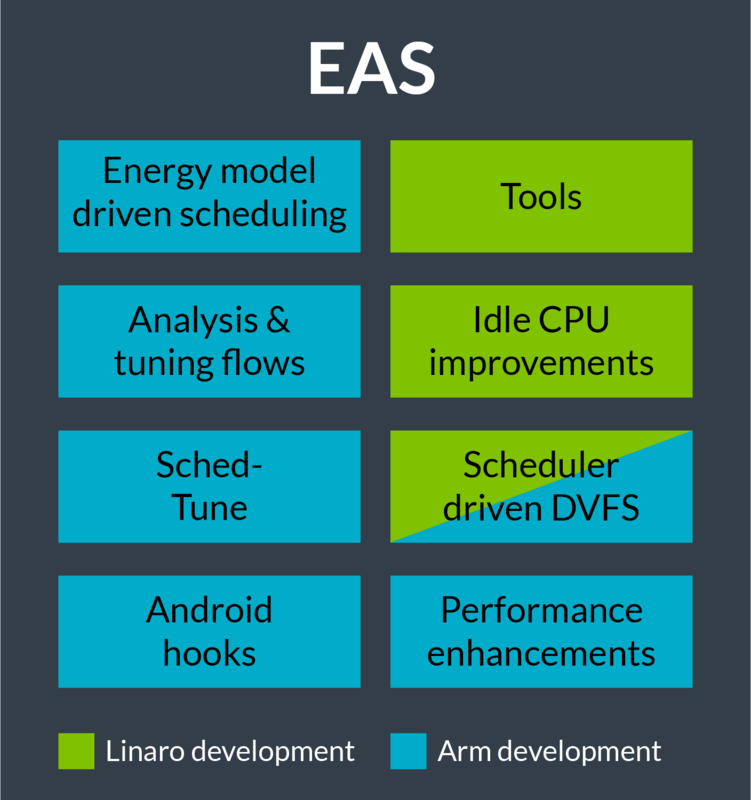 EAS extends the Linux kernel scheduler to make it fully aware of the power/performance capabilities of the CPUs in the system, to optimize energy consumption for advanced multi-core SoCs including big.LITTLE. With EAS, the Linux kernel will use the task load and a CPU "Energy Model" to control task placement to select the optimal CPU to run on. To check whether your device is already using EAS ROM, you can see the CPU governor in 3rd party apps [default governor is schedutil, not interactive like on HMP], or you might see the kernel name because the maintainer usually put EAS on it. Current Linux power management that based on HMP [Completely Fair Scheduler] basically using odd manner on its subsystem, like a throughput based policy that place new task to the idle CPU. As you can see on the diagram below, CFS will choose either CPU#1 or CPU#3 for its new task. With those two options, EAS may choose CPU#1 since it just needs small addition of energy than CPU#3. Because EAS doesn't evaluate all possible options. It simply use the faster possible way with minimum efforts and energy. The schedule is like a lazy but clever employee. CPU the task ran on last time. CPU chosen by a simple heuristic which works out where the task fits best. Based on the energy model, EAS evaluates these two options that have most energy efficient. While some developers decided to shut down the "unused cores" [read: performance cores] to maintain the battery life, EAS can do better. Since it can give the performance you need with lower power usage and utilize the cores faster and smarter, and on the paper, it'll give you more longer battery life. The problem might lies on us and probably the imperfection of its implementation. Because in real life, we tend to draw the performance to the max to play such heavy games and hoping that it'll give better battery life and SOT, and I know that you will be disappointed. We should know that power efficiency on EAS will perform better at multi-tasking and normal usage. But to draw to maximum performance usage, aside giving us best possible performance, it'll makes the power efficiency schedule task useless. "How about EAS implementation in MIUI?" some of users asked me about this. Basically, moving to EAS instead of HMP/CSF is better and easier for developer since it's already merged to Linux kernel sources. Problem might lies on the user experience. Implementing EAS means users need to do a clean flash, thus the update can't be delivered through OTA. With the rise of link leaks by many users, it can be resulting in fatal things that can harm the device. EAS needs to be compiled and tested carefully. It means, either MIUI will give us only Fastboot ROM for the only upgrade options as soon as it goes stable enough, yet it needs to revoke any Anti-Rollback Policy to prevent further problem, or EAS-based MIUI should come along with new device instead. But the main question is, "Will MIUI come with EAS?" That's all folks! See you in another Fun With Chou! This article has been updated in August 7th to meet users' demand with a bit revision. CLAYTON_WWC + 10 + 5 Fantastic! dree2016 + 10 + 3 Cool! Click Reply to Notify Me.